This year's Super Bowl Sunday will place two major Jewish philanthropists against each other. The New York Giants are co-owned by the Tisch family and the New England Patriots are owned by the Kraft family. Joint Media News Service's Jacob Kamaras provided the "who's who" for both families and which Jewish organizations they all lead. In the Giants' owners' box you have "film and television producer Steve Tisch, son of Bob, as the team’s chairman and executive vice president. Bob’s brother, Larry, was the father of Jim — former president of the UJA Federation of New York and former board chairman of the Conference of Presidents of Major American Jewish Organizations. Jim’s wife, Merryl, chairs the board of the Metropolitan Council on Jewish Poverty." On the other side of the field you have the Tisch family with "owner Robert Kraft’s wife Myra—who passed away last July—served as chair of the Boston-based Combined Jewish Philanthropies’ (CJP) board of directors and was twice co-chair of CJP’s annual fundraising campaign." Both families are responsible for donating mega amounts of charitable gifts to major Jewish organizations, both here and in Israel. So, which Jewish owner's team will come out victorious on Sunday night? For that we have to go to Rabbi Joshua Hammerman, who each year uses his Torah erudition to select the Super Bowl winner. Just before Super Bowl 42, you recall, the Patriots were busted for spying. In my prediction before that Super Bowl, which I am not repeating here, I noted that in the book of Numbers when the Israelite spies confronted "giants" as the scouted out the land, they reported back that they felt "like grasshoppers." I noted that anyone who has ever been to Boston knows that high above that home of the original Patriots, Faneuil Hall, there sits a weathervane in the shape of, you guessed it, a grasshopper! I also noted (in that prediction, which I'm not repeating here) that the Patriots wandered for just over 40 years before winning the first championship in 2002. So they had already served their time for the sin of the spies, which, as you recall from Numbers, was 40 years. For 40 years, the Patriotic spies were never able to stand up to the Giants...or the Raiders or Steelers or Dolphins, for that matter. But no more. First they sacrificed the Rams in Super Bowl 36, then they pillaged the Panthers and flew on wings of Eagles. Now, coached by a former Giant, they have become giants - in their own eyes, and the eyes of the other teams in the league. I then noted (but am not repeating here) that Giants are called both Nefilim and Anakim in the Torah. The Nefilim were mythic humanoids that filled the earth before the flood, much like the Titans of Greek mythology (a Giant-Titan Super Bowl would have been a doozy), while the Anakim were the ones who petrified the Israelite spies. There is one other giant of note in the Bible: Goliath. But it isn't just Goliath who bit the dust, folks. When Rashi tried to explain the term Nifilim, he related it to the Hebrew word "nafal," "to fall." As Rashi (he was so good at predicting games that they called him "Rashi the Greek") understood it, the Giants fell. Based on Rashi, I concluded then that the Giants would fall. What I didn't account for was the heroism of an unexpected David, whose last name is Tyree, who also happened to be a Giant. That was then, this is now. I can't repeat my prior prediction, lest I tempt fate and repeat the result. Many people enjoy Super Bowl Sunday, but not for the actual football match up. It is after all the second biggest eating day of year after Thanksgiving. So many people look forward to the food. 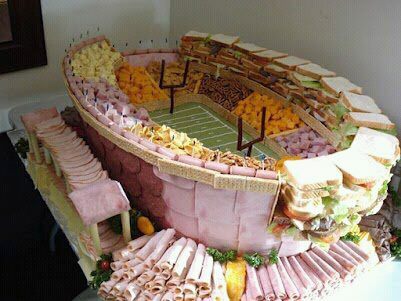 I found this very non-kosher, but very cool looking Super Bowl food creation. It could very easily be adapted to a kosher creation by using only kosher deli meats and getting rid of the cheese and cheese snacks. And while we're at it, how about substituting some rye bread and onion rolls for that white bread? I know one former NFL player who would enjoy this treif tray. Former New England Patriots punter Josh Miller, who is Jewish, played for the Patriots in Super Bowl XXXIX and was recently quoted as saying that he was craving a ham sandwich with less than a minute to play in that game, which the Patriots won 24-21 over the Philadelphia Eagles. Well, I was enlightened again by this scintillating blog, I didn't know about the Jewish ownership of both the Giants and the Patriots? Whatwould the Jew-haters say now? but they say it anyway. BTW, the workd used by the spies for giants are "nephillim" . This name rather than the comon name: Anakim, is used in Israel to describe the generation of the founders of the State, Dor HaNephillim.